Product information "ART USB Phono Plus PS"
The ART USB Phono Plus PS is the perfect interface solution for transferring any precious collection to your PC or laptop. 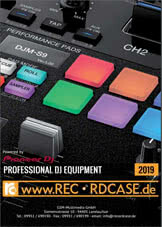 Equipped with a low-noise RIAA phono pre-amp circuit with low cut filters, this function enables you to remove rumble and noise on your audio-tracks. The best guaranty for pristine audio captures. So this device represents the ideal high performance audio interface between analog and digital sources. Front mounted gain control and Signal/Clip LED allows easy optimization of a wide range of analog input sources. The USB Monitor/headphone provides zero latency monitoring of the input source for easy cueing. The ART USB Phono Plus PS can also act as audio playback source for any USB equipped computer or laptop. Optical TOSLINK Input and Output as well as an S/PDIF Input make the USB Phono Plus PS an ideal analog / digital audio to USB interface as well. The built-in low noise Phono Preamp circuit is highly accurate and precisely conforms to the RIAA standard. The Line Out jacks are always connected to the input preamp signal for source monitoring or to allow use as a stand-alone phono preamp. Housed in an all-aluminum black anodized case, the ART USB Phono Plus PS can be powered by either external power supply or directly via USB port. To ensure maximum versatility, the USB Phono Plus PS is fully compliant with the USB 2.0 specification and uses USB adaptive mode for playback and USB asynchronous mode for record. It will work with Windows 98SE/ME/2000/XP/Vista/7 USB audio device drivers as well as Apple OS9.1/OS-X computers with native USB support. 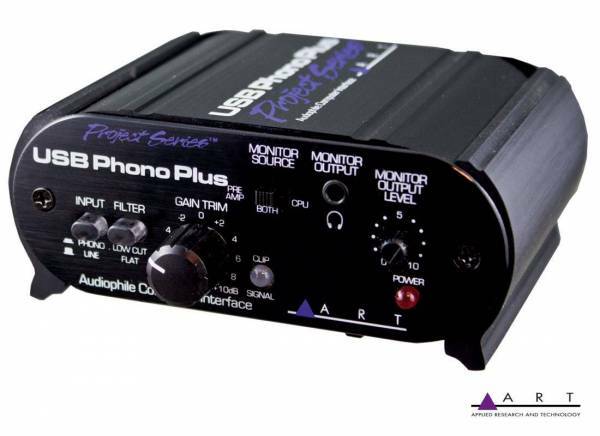 The ART USB Phono Plus PS comes with an USB cable and a copy of BIAS SoundSaver Express. Be the first who writes a review for: "ART USB Phono Plus PS"